Recently we celebrated my Grandmother’s 98th birthday–on Friday the 13th! 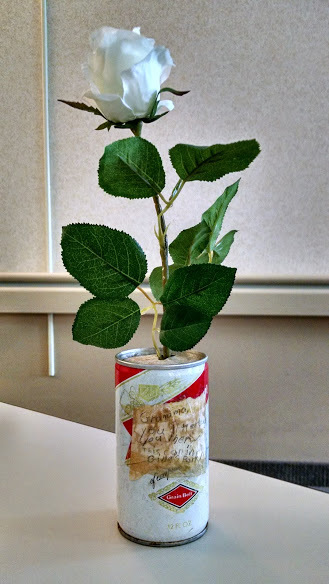 I gave her a silk white rose to brighten her room, and used a very special “vase” I had been saving just for her…. Grandma sipped on her beer as she appreciated my park, and when she finished it, promptly tossed her empty can off to the side in the trees and strolled back into the house with the group. Appalled, I went back and fished out the trash she had left in my sacred ground. Privately sharing my indignation with Mom, she encouraged me to let Grandma know how I felt. Too shy to directly confront the criminal, I wrote a note and taped it to the offending can, which I then presented to Grandma. As it was read aloud, the entire family got a tremendous and supportive laugh! 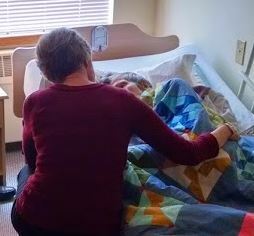 There was lots of hugging, and Grandma graciously apologized. She good-naturedly took the can home with her, declaring that she’d give it back to me when I was a grownup. …for another twenty years! And now, I am sharing the love by passing it back to Sweet Lucille. May it bring her joy, no matter what form, to add to her continued pluckiness and humor. Oh Gina!!! Thank you for sharing! I LOVE the story and the sweet memories. Your pics beautifully illustrate the love shared between generations. Much love and blessings to you and your family as you share the beautiful truth of your love. 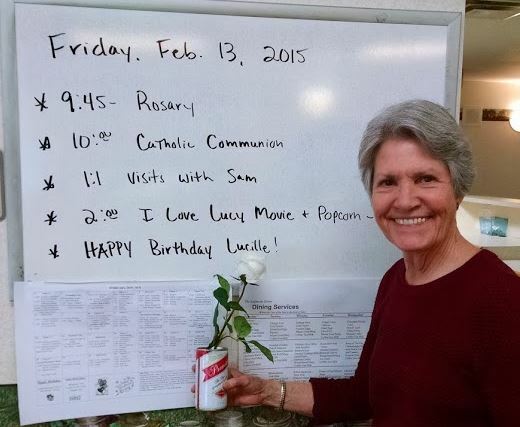 Thank you for sharing this beautiful story about Lucille! I love hearing about the memories that family members have of their loved ones. Lucille’s tender heart and quick wit brighten my every day! Thank you for entrusting her to our care! She is a gem!